The LTE910XF v12.00 XF Footprint Socket Modem is an LTE Category 1 4G cellular modem. 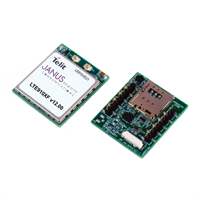 They utilize the Telit LE910-EU1 module as their cellular engine. The LTE910XF v12.00 operates in LTE bands B1, B3, B7, B8 and B20 with fallback to 2G (GSM/GPRS/EDGE) 900 and 1800 MHz bands. The LTE910XF v12.00 is RED (Radio Equipment Directive) Europe certified. The full XF line shares the Industry Standard 20-pin connector footprint and is flexible in implementation - both into new product designs and with existing products. Size: 1.14" x 1.3" x 0.256"